In one of the most buzzed-about debuts of 2009, Daniel Suarez introduced a terrifying vision of a new world order, controlled by the Daemon, an insidious computer program unleashed by a hi-tech wunderkind, Daemon captured the attention of the tech community, became a New York Times and Indie bestseller, and left readers hungry for more. Well, more is here, and it's even more gripping than its predecessor. 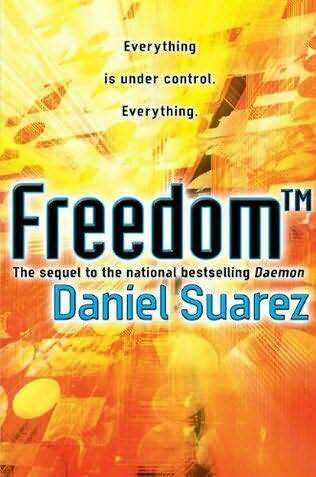 In the opening chapters of Freedom™, the Daemon is firmly in control, using an expanded network of real-world, dispossessed darknet operatives to tear apart civilization and rebuild it anew. Soon civil war breaks out in the American Midwest, in a brutal wave of violence that becomes known as the Corn Rebellion. Former [spoiler], now the Daemon's most powerful-though reluctant-operative, must lead a small band of enlightened humans toward a populist movement designed to protect the new world order. But the private armies of global business are preparing to crush the Daemon once and for all.